Some of you may recall that www.rambleandwander.com was in the running for Malaysia International Tourism Photography Blog Award 2013. This blog eventually managed to garner 292 votes and was selected as one of the Top 3 finalists out of a few nominees. The official result was finally announced last night, 6th March 2013, in Kuala Lumpur. 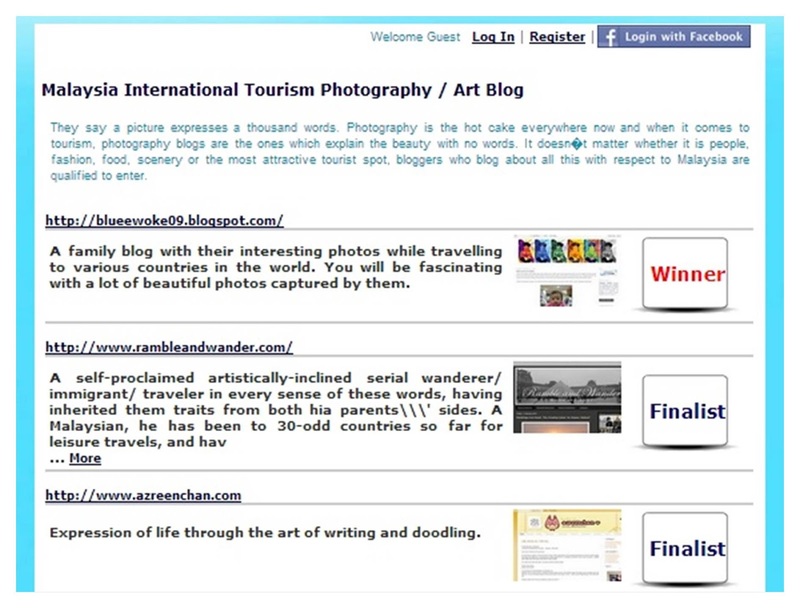 Congratulations to www.blueewoke09.blogspot.com for winning the award, and to www.azreenchan.com for being a fellow Top 3 finalist. If you have the time, do check out their blogs. Thanks, MasMZ. Mestilah kena sokong Tourism Malaysia, heheh! whahahahahaha terpaksa tumpang lalu kat sini... Amin kat suma di atas.